Failure of chemotherapy to reach all cancer cells in a tumour is a major cause of poor treatment outcomes. To study this problem in detail requires a technique for accurately measuring how well drugs bind their targets – so-called 'drug-target engagement' – in the body. 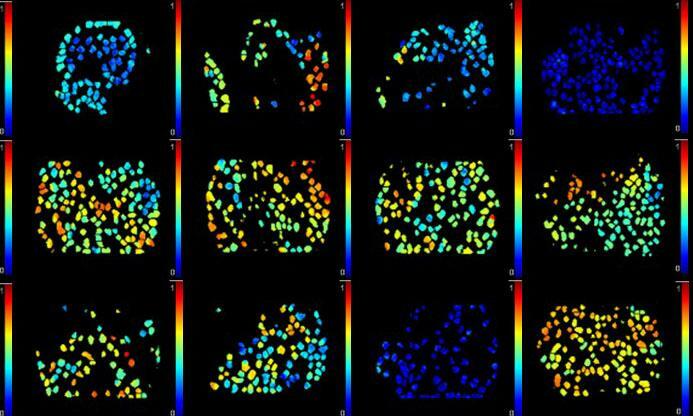 Using their technique, they mapped out how the chemotherapy drug doxorubicin (Adriamycin) targeted ovarian cancer cells in living mice. They found significant variation in drug-target engagement between cells within a single tumour, and between different tumours. They also found that drug-target engagement was better when doxorubicin was administered via abdominal injection rather than intravenously – the currently preferred method for doctors treating patients in many clinics. The technique works by imaging the interaction between two light-sensitive molecules. In this study, the team labelled the DNA inside cancer cells with green fluorescent protein (GFP), which can transfer energy to doxorubicin – which is intrinsically light-sensitive – when it is sufficiently close by. Calculating the efficiency of this energy transfer was used to determine the binding between the drug and DNA of different cancer cells in real-time.